I love the cover of this book – so understated but effective. Susan Cain’s Quiet: The Power of Introverts in a World That Can’t Stop Talking explores introversion and extroversion from a cultural perspective. Charting the journey of our society from one who revered a person’s character to one that idealises the extrovert and everything he can offer, the book also looks at the biological side of the two personality types and environmental factors. The last part of the book is akin to a “how to” guide – topics include how to talk to people of the opposite personality type and how to nurture an introverted child – but Susan Cain doesn’t preach or lecture introverts on how to live. Instead, she offers advice that each reader can mould and apply to their own lives. I saw myself in Cain’s words and explanations for behaviours or preferences that, in the past, I’d been made to feel weren’t “normal”. Before I went to Uni, I was excited at the prospect of meeting new people, but I didn’t look forward to creating friendships. Instead, I was looking forward to the deep friendships that I hoped would come. In Quiet I found out that introverts prefer to create deep friendships and enjoy thoughtful conversations, rather than small talk. I’ll enjoy social occasions such as parties, but I seem to want to leave and retreat somewhere on my own before anyone else does – Cain reveals that introverts need time to “recharge” after highly stimulating environments such as meeting new people. Extroverts, on the other hand, need to “recharge” after they’ve been under-stimulated in quiet environments. My struggles to speak eloquently when put on the spot and my inability to “wing it” in presentations can be explained by introversion. It’s points such as these that are enlightening and empowering – some of my traits now don’t feel like faults, but simply a product of my personality type. I found that Cain’s idea that there is power in being quiet, that introverts can be leaders (and good ones at that), and that introversion isn’t a quality that should be frowned upon but rather valued gives me confidence in my personality. While I don’t see myself in everything Cain explains in her book, so much of it describes behaviour I’ve seen others exhibit too. Realising that behaviour and innate feelings can be attributed to introversion can be incredibly affirming, and I think this contributes to the book’s popularity. Yet it can also feel disheartening that all of our behaviours can be boiled down to our personality types. But, as Cain explains, we’re not all completely introverts or extroverts, but can instead have a mixture of both to create the unique individuals that we all are. Cain has a pleasant writing style that’s easy to read. She articulates the vast collection of psychological ideas, research, and cultural values well, telling them in ways that are easy to understand. The tales of her own research, observations, and experiences are engaging and add support to the research she cites. This mixture of personal experience, historical incidents, and scientific/psychological fact work well together to create a fascinating book that’s extremely accessible. While I did find the book incredibly powerful, I couldn’t help but wonder how I’d feel about it if I were an extrovert. Would I be offended by some of the things that Cain is saying? Would I feel that introverts are meant to be superior? The book doesn’t have an “introverts are superior” tone, despite being written by an introvert. Instead Cain gives us a balanced view, showing us that we need a world with both introverts and extroverts – it’s just that one personality type is currently more valued in our society than the other. The book resonated with me because I saw so much of myself in its pages, but this book can be read and enjoyed by anyone – whatever your personality. Whether you’re married to, going out with, manage, friends with, or parents to an introvert, this book gives a startling and valuable insight into introverted behaviour. There’s a negative stigma attached to introversion, but the more people that read Cain’s book will hopefully see its positives and help to change this view that introversion is something that needs to be corrected. Have you read Quiet? What did you think? Did your personality type change your reading of this book? I’ve wanted to read this for a while – it’s hard sometimes being an introvert when most of the time you’re surrounded by extroverts, but for me it helps to know that needing to “recharge” after busy, noisy events is actually normal for introverts. Before I found that out, I felt guilty if I wasn’t always up to being outgoing, especially after a long day. Now, I allow myself quiet moments to myself without the guilt, and it feels great! 🙂 Thanks for the review! 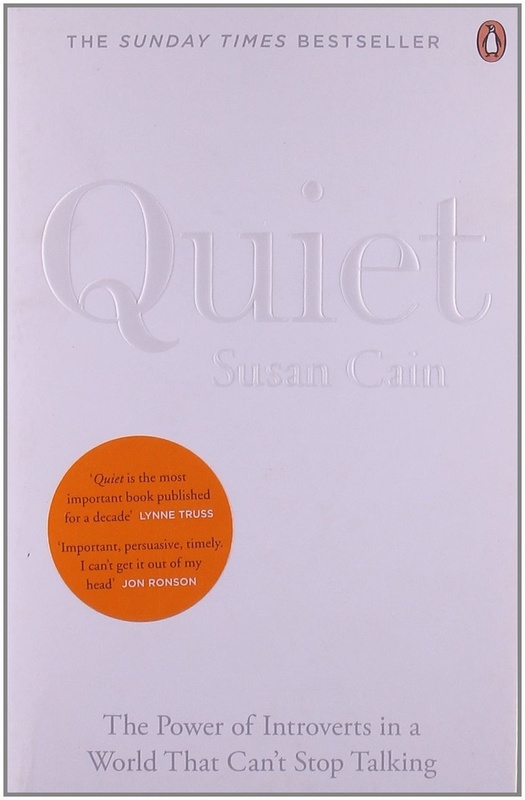 Quiet is brilliant – I liked how Cain differentiates between shyness and introversion as they are not the same thing. I agree, I think it’s actually one of the first books or articles I’ve read that differentiate between the two. I felt the same way when I read Quiet, I was fed up of teachers always saying that I was a quiet student like it was a bad thing!